The astronomical darkness has finally arrived. At the start of the new season I decided to try my luck with a small mosaic project of the North-America and Pelican nebulae as the objects are fairly bright and the darkness lasts only a short moment for now. Last night was the first clear night with astronomical darkness lasting a bit under three hours. In four months the astronomical darkness should last for almost 12 hours, a significant difference there. 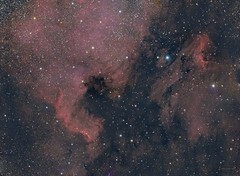 The famous North-America and Pelican nebulae are part of the same vast emission cloud, but the dark dusty clouds between us and the glowing gas shape the view to the familiar shapes. LRGB 2x2 frame mosaic, 3x5min per channel and panel. Original frame at 100dpi would yield a nice 150x110 centimeter poster, but more light is needed for better SNR and color gradient corrections.